Readers of the Blog will doubtless be familiar with the main elements of the recent Williams Commission report, and the debates about local council reform that the report has prompted. As various people have commented, local government reform is a potentially difficult issue for the Labour party. As the governing party in the Assembly, it should be taking the lead. Moreover, it can hardly be seen to be ignoring calls for the improved delivery of public services. But Labour also has a lot to lose. Labour has far more councillors in the 22 local authorities than all other parties in Wales put together. If the number of councils is trimmed significantly, one must assume that the number of councillors will also fall substantially. And even in the councils seats that remain, boundaries are likely to be re-drawn and in many cases individuals who held what looked like safe seats may have to compete in more difficult circumstances. A very large number of Labour councillors would likely be affected negatively, therefore, by any local government changes. This was the context which prompted ITV Wales and ourselves, in designing the most recent Welsh Political Barometer poll, to include a question on public attitudes towards Council reform. Obviously we could not assume that most of public was familiar with the text of the Williams report. So we tried to ask a question that was simple, yet still able to investigate whether there was a dominant mood in public attitudes towards potential local government reform. “A report for the Welsh Government has proposed cutting the number of local councils in Wales. Supporters of this proposal believe that larger councils could be more efficient whilst opponents believe that larger councils would be more distant from the people they are meant to serve”. We then asked, “Which of the following would you prefer?” with respondents asked to choose between the following options. Overall, we saw a very even split among respondents between the first two options. 34% favoured no change, while 36% supported the reduction in council numbers to between 10-12. Perhaps unsurprisingly, only 8% favoured abolition of all councils; the remaining 22% picked the ‘None of the above’ or Don’t Know options. 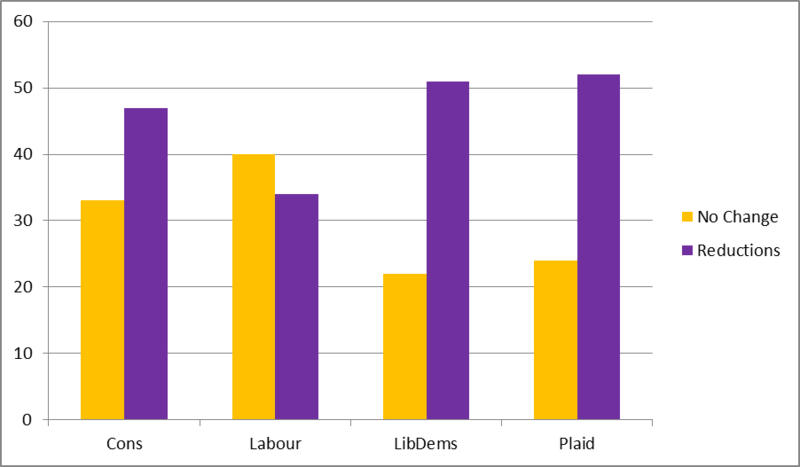 As can be seen, the balance of opinion for Conservatives, Liberal Democrats and Plaid Cymru supporters is very much in favour of reform, with absolute majorities of both of the latter groups favouring change.